I’ve been excitedly waiting for the gas bill for a couple of weeks now, and yesterday it finally arrived! Yep, you read that right. I was excited by the thought of receiving the gas bill. 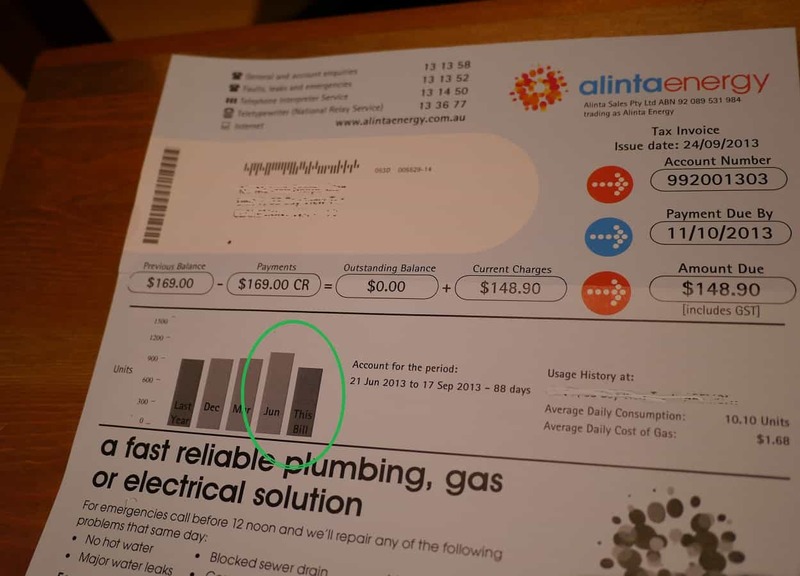 Three months ago we decided to be pro-active about reducing our gas consumption because we realised our gas bill was unusually high for such a small flat, and being conscious of our environmental footprint, we decided to do something about it. Living in a rental, we couldn’t do much about the rubbishy cheap inefficient boiler with the gas-wasting pilot light that the landlord had installed. What we could do, and what we did, was reduce the pilot light to the lowest setting and lower the temperature setting so that we no longer need to add any cold water when we shower. That was it. A super simple way to try to reduce our fossil fuel consumption with the added bonus of saving us some pennies (or cents, technically) in the process. But would it actually make a difference to our bill? Our daily consumption has reduced from 11.49 units to 10.10 units, and our bill for the last 3 months has reduced by $20. Which means we should save $80 a year simply by spending 15 minutes reducing the temperature setting. I think that is a great return! My boyfriend, however, was slightly underwhelmed. He was hoping the gas bill would reduce by half! But once he got over his initial disappointment he agreed that it had been a worthwhile exercise. I don’t think there’s much more we can do to reduce our consumption further, short of actually turning the boiler off, and even in the height of summer I think this is unlikely to happen. As well as the unappealingness of cold showers, if the pilot light goes out, it is extremely difficult to get it to relight – we learned this from experience! It was great to see on paper how this simple change had actually made a difference – both to our bank balance and our fossil fuel consumption. If you haven’t adjusted yours, seriously, do it now. it will take you 15 minutes – probably less. I can’t believe I ever used to run cold water into my hot water to cool it down. What a waste of money and energy!